I finished my Simply Style 4 Patch quilt this week. The prints all came from this layer cake given to me by Daughter #1. The quilt finished at 56 by 72 inches. I used a pantograph called Yodel to quilt this with Glide thread and Legacy 80/20 batting. The backing is a new Ralph Lauren sheet. I love the colors and have had great success using sheets for quilt backs. However, this one was a bit too tightly woven and cased some tension headaches! I have one 4 patch turned the wrong way! Can you see it? I really love simple patterns and this one really allows the beautiful fabric to shine. 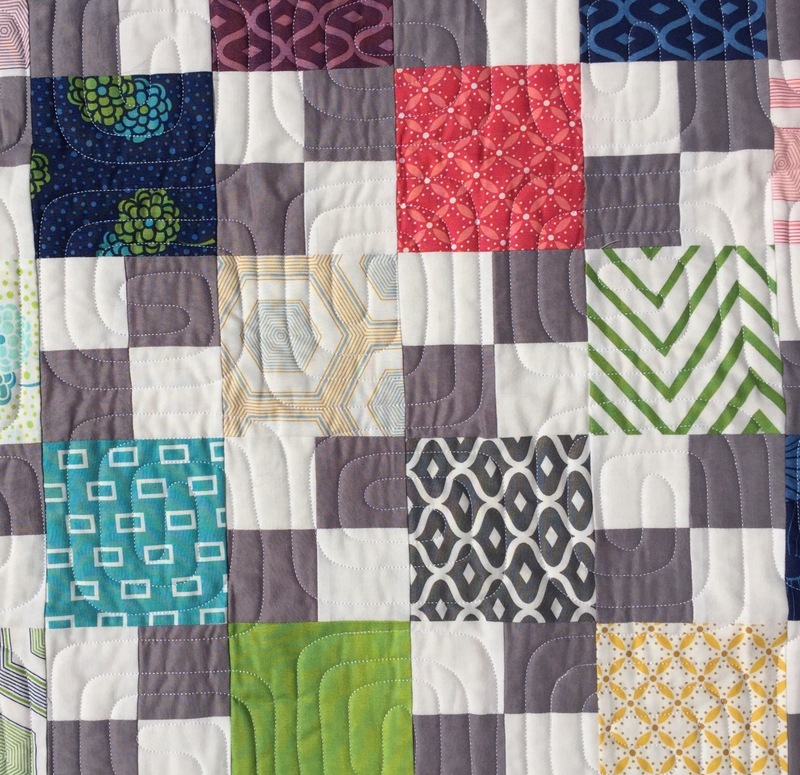 This entry was posted in Finishes, Fresh Modern Quilts, Precuts, Uncategorized. Bookmark the permalink. Bottom row, next to the Blue square. Took awhile but I found it. Otherwise it is beautiful and you can’t find the error unless you look hard! 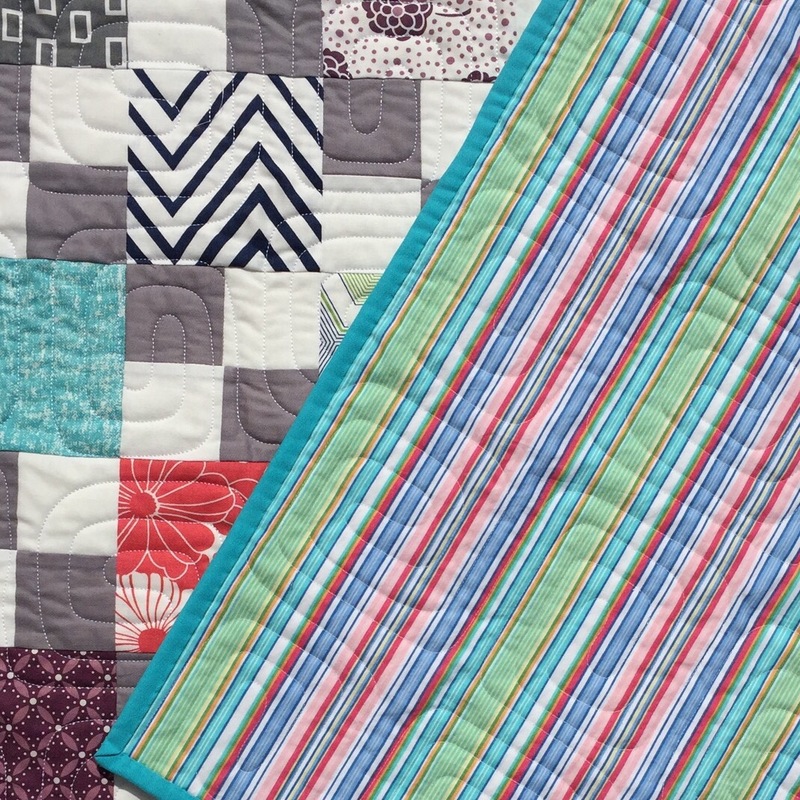 Love your quilt and the quilting. The colors are so wonderful. If I hadn’t read one of the comments above I wouldn’t have found the turned around 4 block. I have had many of those didn’t see faux pas until well after he quilt had been finished. This is so pretty! I have a sheet similar to the one you used that I am holding on to for use as a backing. I love the stripes! I really like this quilt!! What size are the squares for the four patches? Lovely! I’m always so jealous of your quilting. It’s always so flat and perfect. Well, it looks perfect to me, anyway! Hey, if only one is turned the wrong way, or even 10, you did a fantastic job! Pointing out your errors is not required! Great finish! 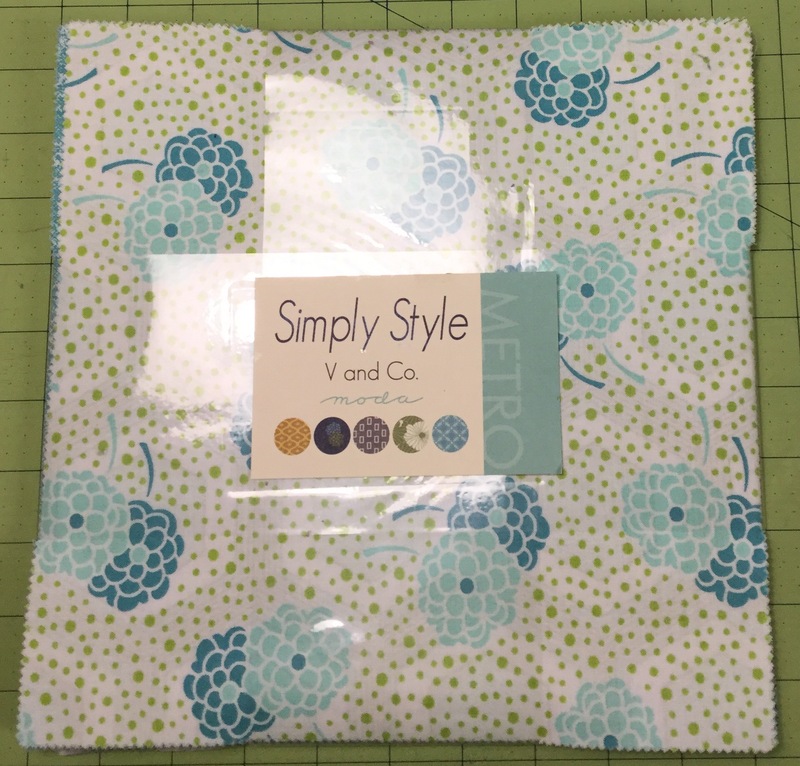 Like a couple of other commenters mentioned, I never think to use a sheet for the backing…will have to keep that in mind….the sheet you chose is perfect for this quilt! I did find that wayward block, but not without a lot of searching! 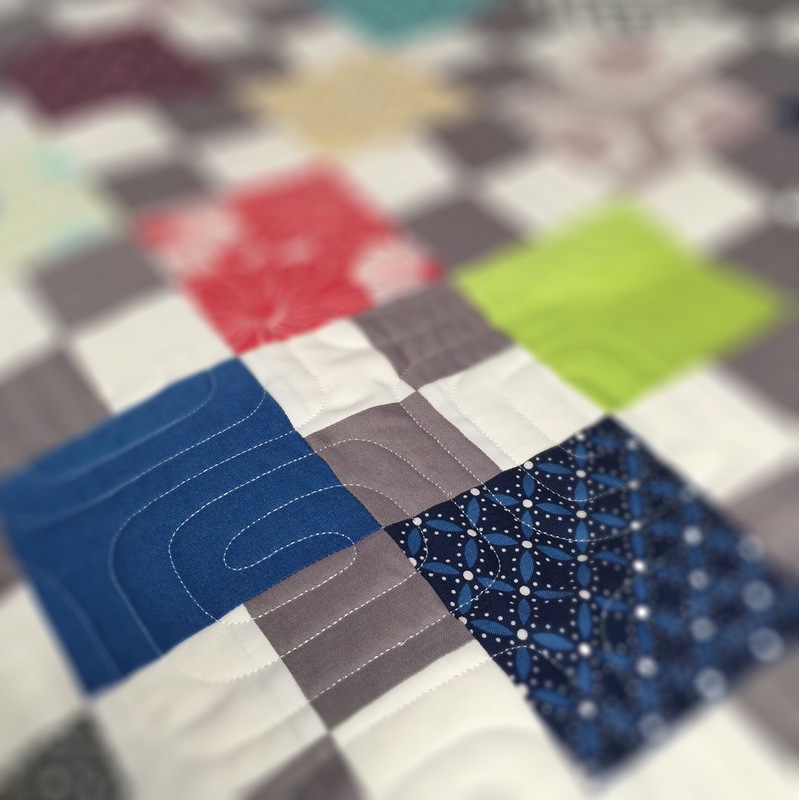 I think it adds a bit of charm to the quilt…. Great finish! I really like the backing fabric. Sometimes those sheets are difficult to quilt. You never know until you get started on them. I agree with Val W…simple but lovely to look at! The quilting design is perfect for it. Great quilt. I really love where the darker blue charms fell and how they pop out!! Such a great finish! Try as we might, sometimes details get away from us. It took me forever to find it…I was going cross eyed! I quite simply love it ! I love that!!! What a great color ful quilt. The backing is pretty too – sorry it caused problems. And he is not going the wrong way – that is just an independent block – ha ha! Lovely quilt. Found the block that is backwards. It’s funny cause when I do this I see it everytime I look at that quilt , but no one else can find it. When I look at mine it makes me relax and know that nothing is perfect and quilting is for fun. Have a great weekend. This is beautiful. Love the fabric and choice of quilting. The “mistake” is not easy to find and is just your humble spot. Wonderful as always. It took me awhile, but I found it! Beautiful finish! 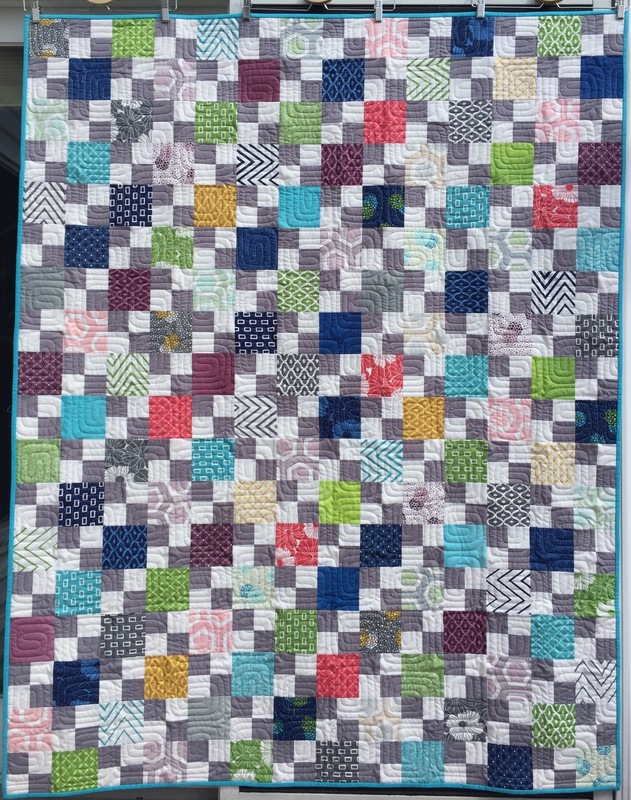 I love all the colors with the gray and the quilting design is perfect! This is a wonderful finish Katy, and the backing is the perfect print. I always forget about using sheets for backing. I found the block but only because you mentioned it…..stop that! 🙂 I agree with Piecefulwendy – it adds an element of fun. I love this one. It looks vintage and modern at the same time. What a lovely quilt, and the backing is really nice. I had a little trouble finding the wayward block (might be because I haven’t had my morning coffee yet), but I think it adds a bit of whimsy.